Anyone tempted to think that betting and unscrupulous play is a recent scourge on the game should read this meticulously researched book by Malcolm Knox. The book concentrates on the first Australia and England Tests through to the Great War and portrays the first Australian sides to visit England as mercenaries and, in today's terms, shows how much money the players made from such a tour. It should also be noted that, long before the days of air travel, these tours could be six months in duration and that the players had to forego their businesses. Equally, they were classed as amateurs but their bargaining skills seemed to get harder with each tour. 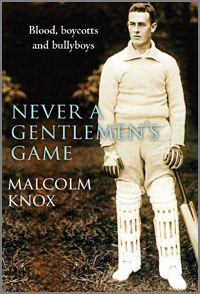 Malcolm Knox has done a tremendous amount of research and we learn more of legendary players such as Fred Spofforth, "The Demon"; Billy Midwinter, the first player to represent both Australia and England; Billy Murdoch, who eventually settled in Sussex and our very own W.G.Grace is adequately mentioned. Stories of W.G are legion and this book touches upon his enthusiasm to win at all costs and, as one fast bowler described him, "an artful old toad". The channels nowadays available for aggrieved players did not exist in the early days of Test cricket and any disputes were likely to be settled with a pair of fists and there are many such tales. Umpires weren't always welcomed, betting was rife within the crowd and many a game was stopped because of various fracas. The first few Australian tours appeared to be a closed shop and the same faces would appear regularly without much concern given to their age. Warwick Armstrong's negative bowling is touched upon and showed that a form of leg theory existed well before the infamous Bodyline series. The reader will learn how teams were selected in the early days, the power of the Melbourne Club and how, eventually, sides were selected by a Board: it didn't necessarily make for any harmony, there were player/managers and plenty of ill feeling. It is suggested that not all sides were necessarily representative of the best cricketers in the land. Knox writes with a good deal of wit and there are many hilarious instances of banter. W.G, once bowled, was told by the bowler to consider not going as there was still one stump standing. Knox has an engaging style and I found this book tremendously interesting and readable. What becomes clear in this excellent book is that the early cricketers certainly weren't naive on and off the field. From the Australians who loved parties and more dubious off-field activities to W.G's vast fee for touring Australia for a second time many years after his less than harmonious first tour, I would recommend anyone to read this book not only for the less salubrious aspects of these early cricketers but also because we can learn so much about them as cricketers.